Students will make a 12" stepping stone using a new technique with mesh. Mesh allows you to work on your design when you have time. Move your pieces until you get them right, allows for more intricate designs and vertical mosaic work. Perfect for outdoor items. All supplies included with class registration. Please bring mosaic nipper and cutting tools. You will have a sealed wood bird house to start working on. There will be a wide assortment of cool glass, Lake Superior stones, drift wood and beautiful one of a kind embellishments to choose from. What kind of a house would you like, if you were a bird? Make a unique stepping stone to display in your garden or walkway. May be left out year around. Instructor will offer tried and true templates for your use if you'd like to use them. All materials included. 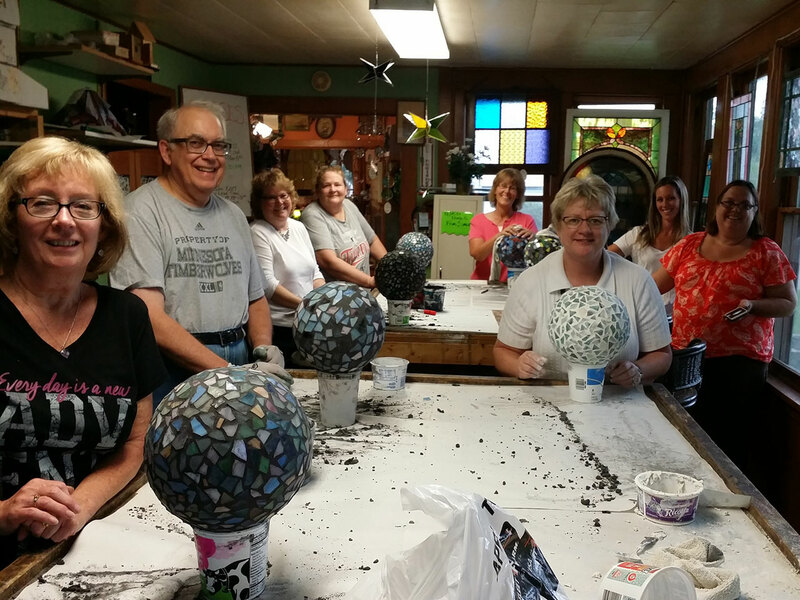 Students will learn how to prepare and build a mosaic garden stone. 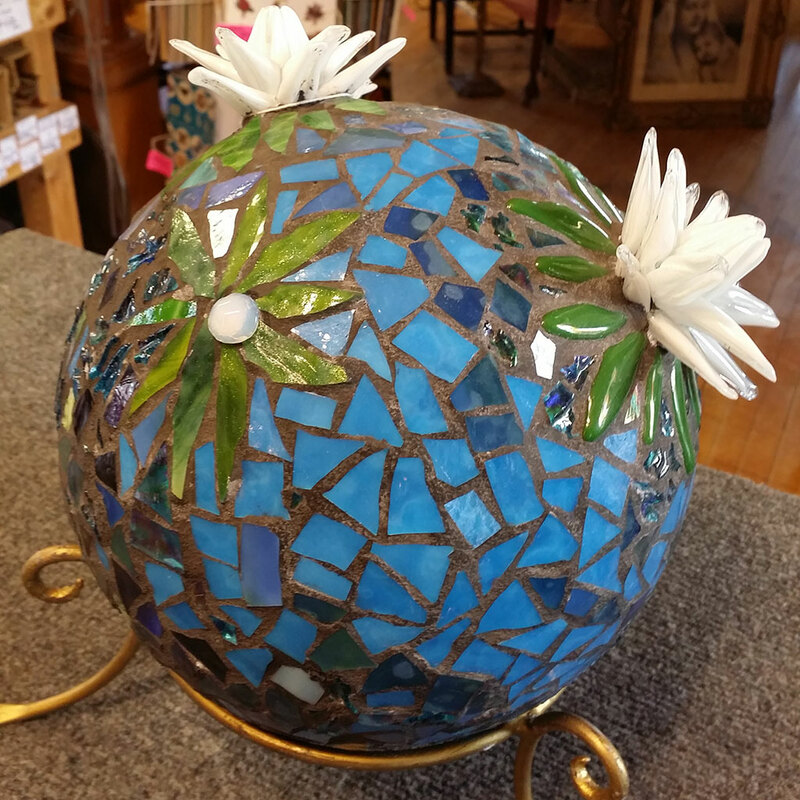 Create your own masterpiece using a wide variety of items supplied by the shop. Supplies available at store to buy or rent. This is a GREAT class to take! 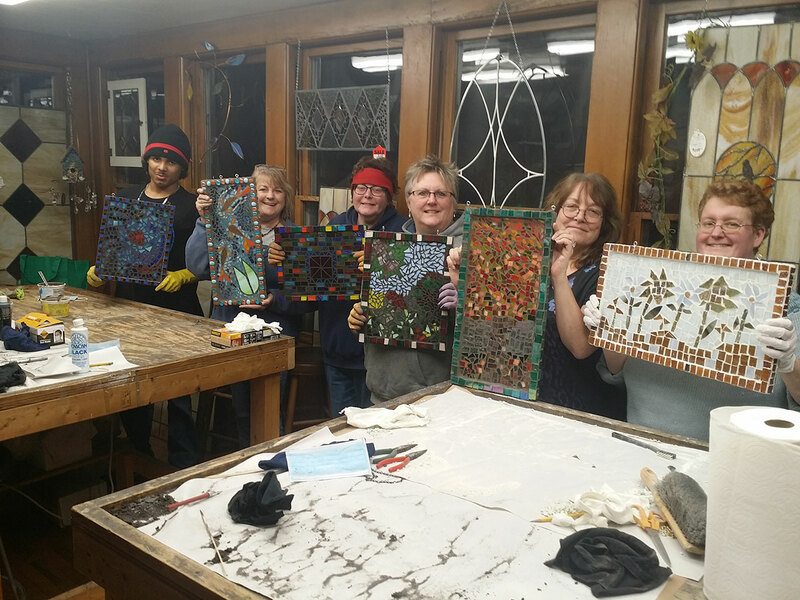 Students will learn how to prepare and build stained glass on stained glass without using lead or copper foil. Create your own masterpiece using a wide variety of items supplied by the shop. All materials included, except mosaic nipper. Available at store to buy or rent. Students will design a mirror using a wooden base. You'll learn , what to use, how to build it and how to finish it. 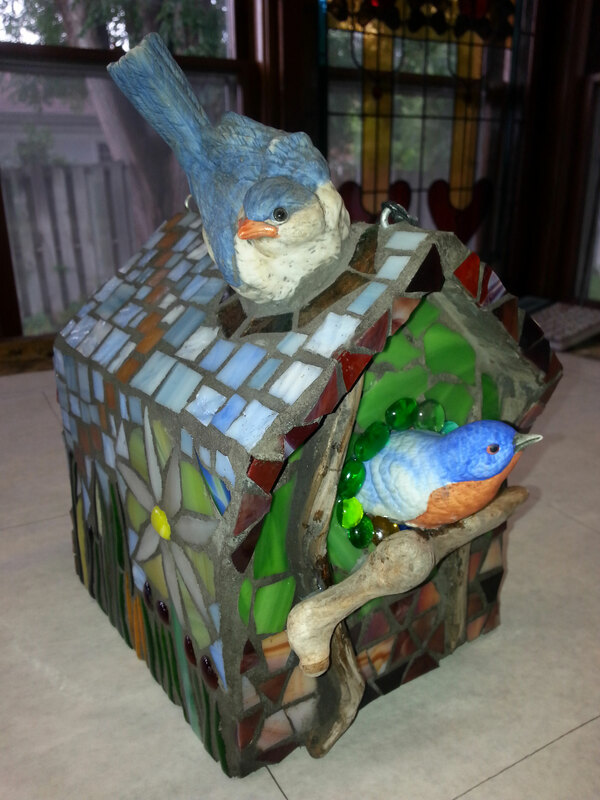 Shop offers stained glass, nuggets, shells, granite, stones etc. Make this project truly your work of art! All supplies included. Have something you'd like to use? Bring it along! 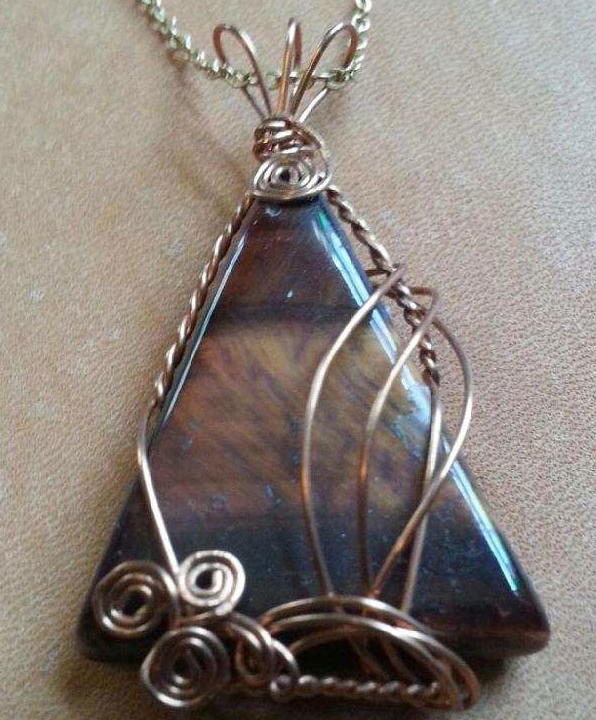 This round wire wrapping class will teach you how to construct a simple but decorative pendant using base metal wire and a cabachon (a stone with a rounded face and a flat back). Using only a few hand tools, you will learn how to properly twist two wires to form the base of a standard round wire setting and securely encase the stone into a pendant. This technique is done without soldering the wires or using any glue. 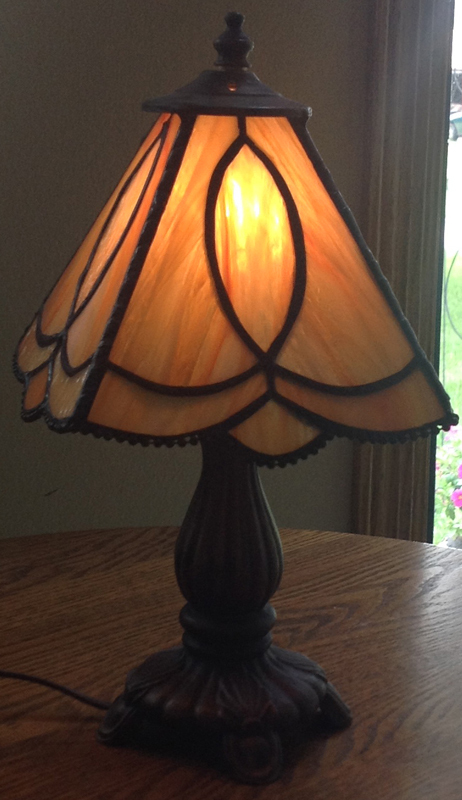 Students will learn the steps while building a panel lamp shade. Supplies needed include: glass, lamp base, lamp hardware (this will be discussed in the class and all parts will be ordered). One additional item that is helpful is the Morton system layout blocks and push pins ~ available at the shop. Students should bring all tools, and supplies for copper foil. Soldering irons, solder and soldering chemicals are needed on the last night of class. 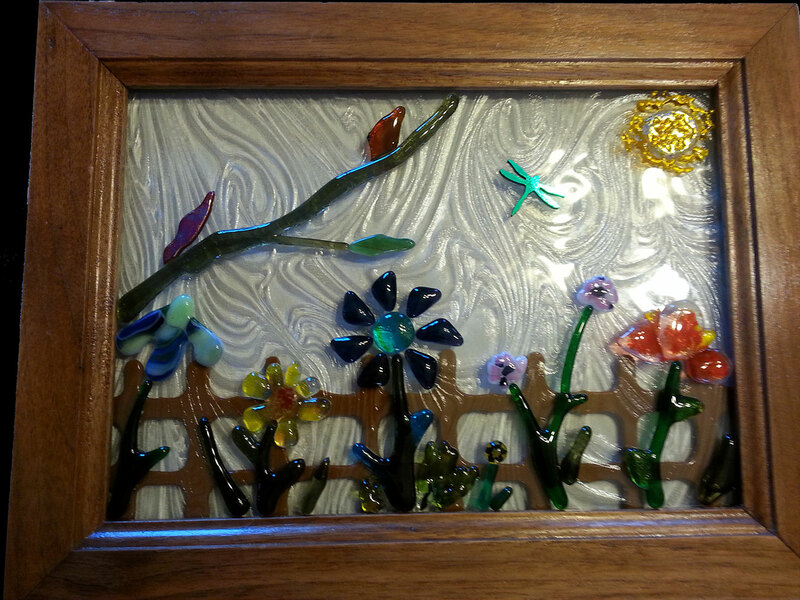 Students will enjoy their morning nipping and designing a small fused garden window, average size window frame 12"x 9". Students will choose from an assortment of clear textured glass to replace their clear glass if they wish. The first day will be used to build the garden. Projects will be fused, ready to go by the next class. Second class meeting to finish the project. Please bring mosaic nippers if you have them. Students may purchase nippers or use the shop nipper for $5 the 1st class. All supplies and fusing are included in class price. 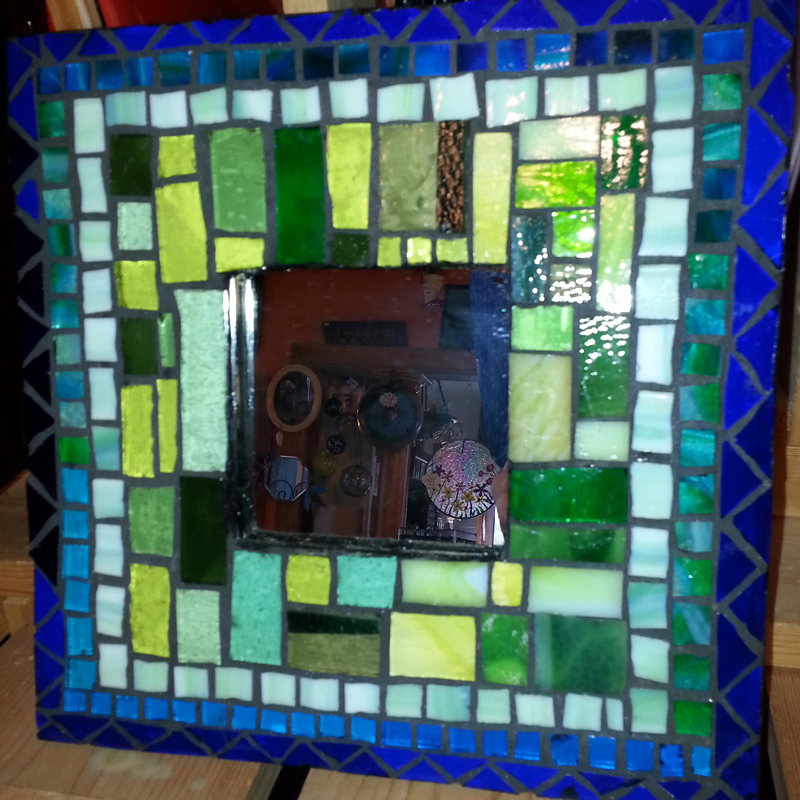 Glass cut and foiled 1st night, built, soldered and finished 2nd night, bring appropriate tools. Students will choose and cut glass following the pattern supplied by the shop. 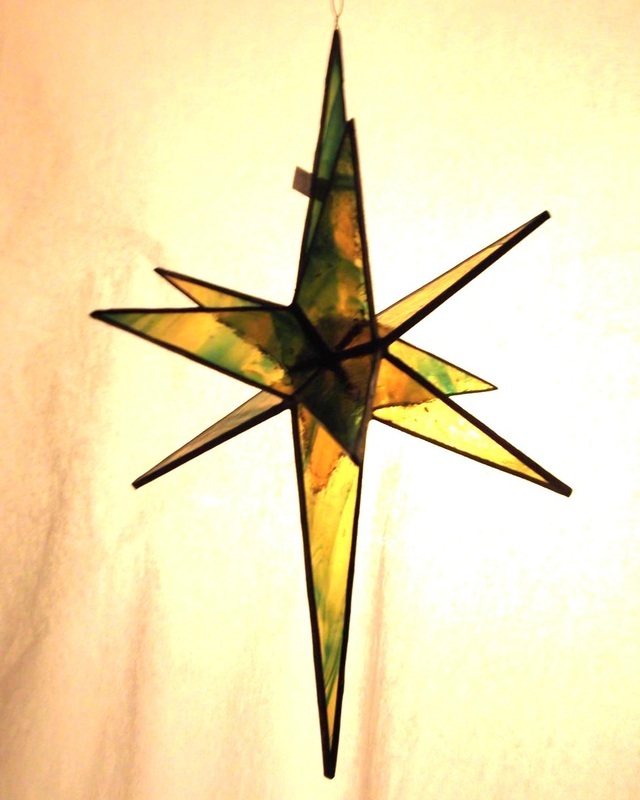 Next you'll copper foil your pieces and learn how to construct and solder a three dimensional star that will spin when hung. They're beautiful! 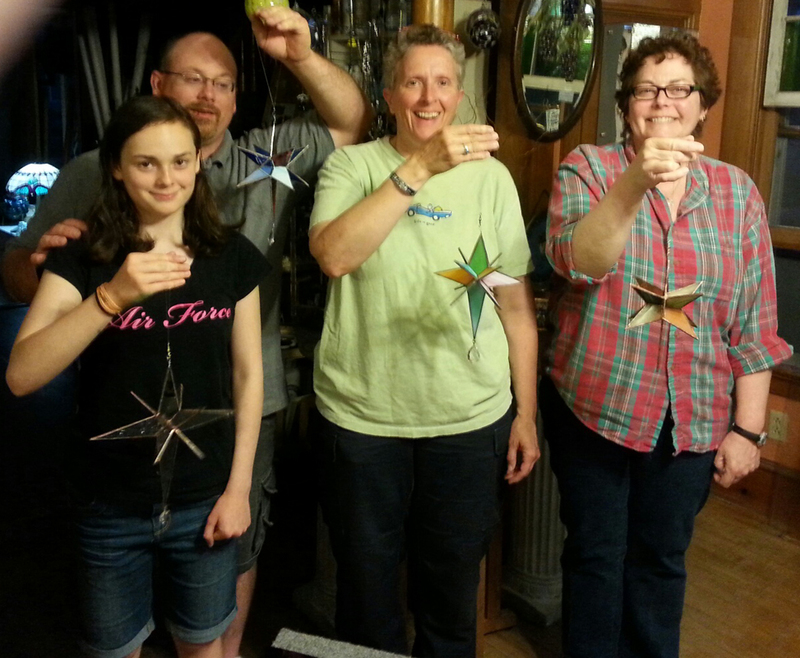 Students will also receive two larger star patterns that can be made at home. Supplies needed and bring tools. 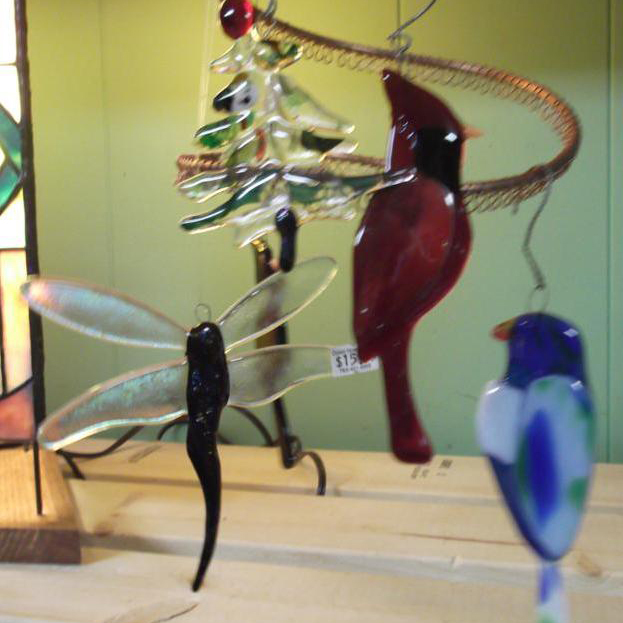 You will cut out your ornament shapes and decorate them with Spectrum glass used for bird ornaments, 96 glass, frit, stringers etc. 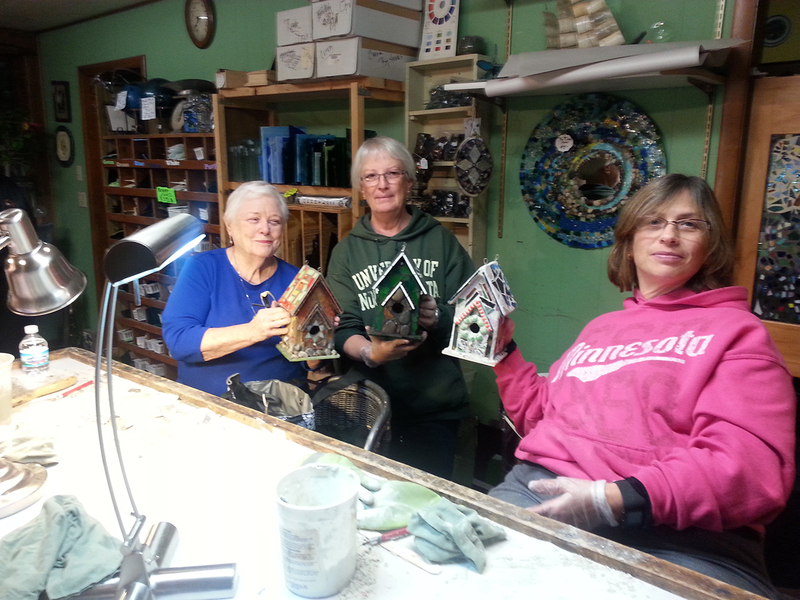 Ornaments will be fused at the shop and be picked up the following week. A real Christmas keepsake. Enjoy a glass of Christmas cheer! Supplies included. 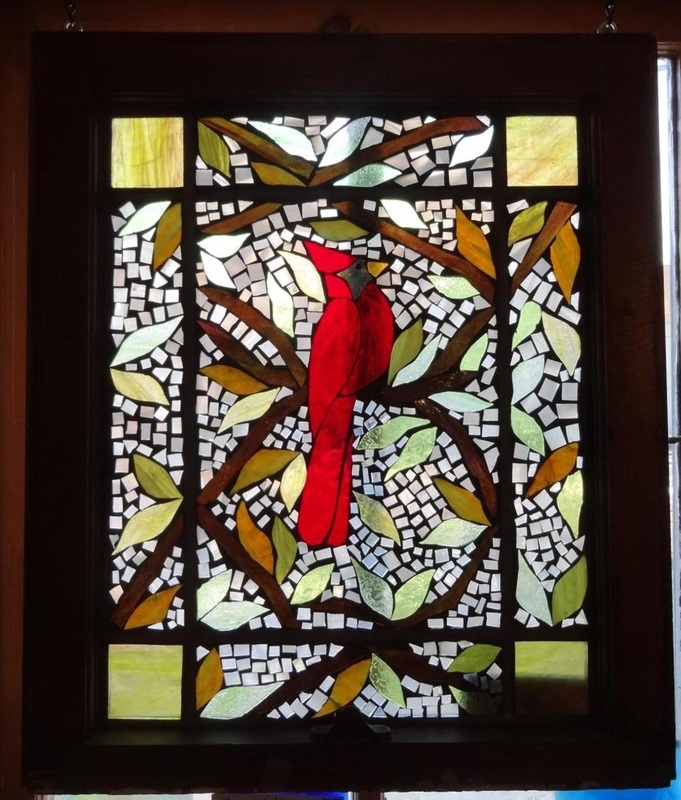 Glass cutter or mosaic nipper needed. Create a beautiful piece of art using a vintage plate. Students will learn Paula’s technique for building a unique art plate. 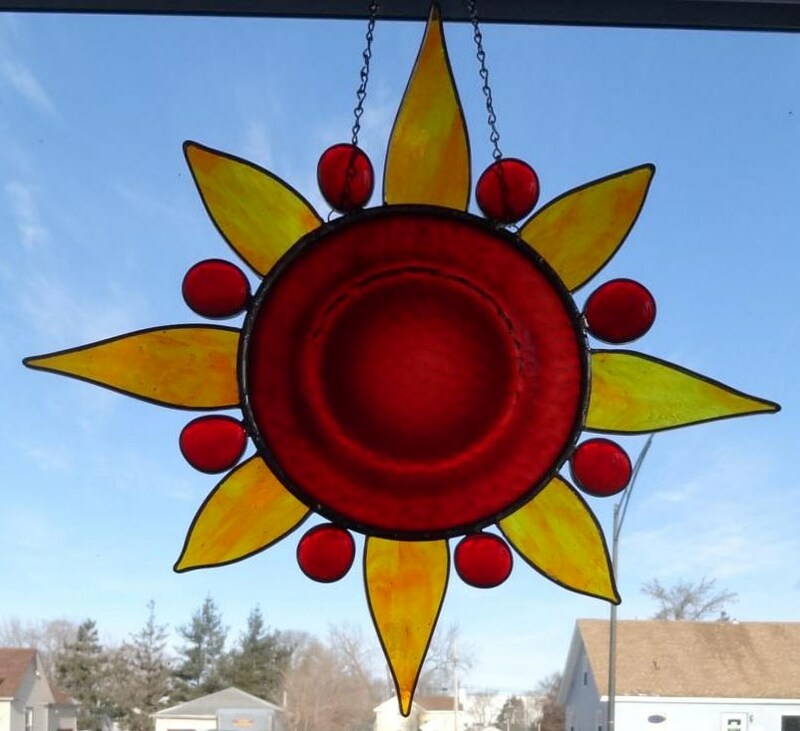 Learn how to make a pattern, which lead to use, how to space glass pieces and embellishment. You may bring a plate from home or purchase one at the shop. Stained glass will be used on the plates, nuggets are optional. Students will build their Christmas Light on a glass block with a hole for white lights. 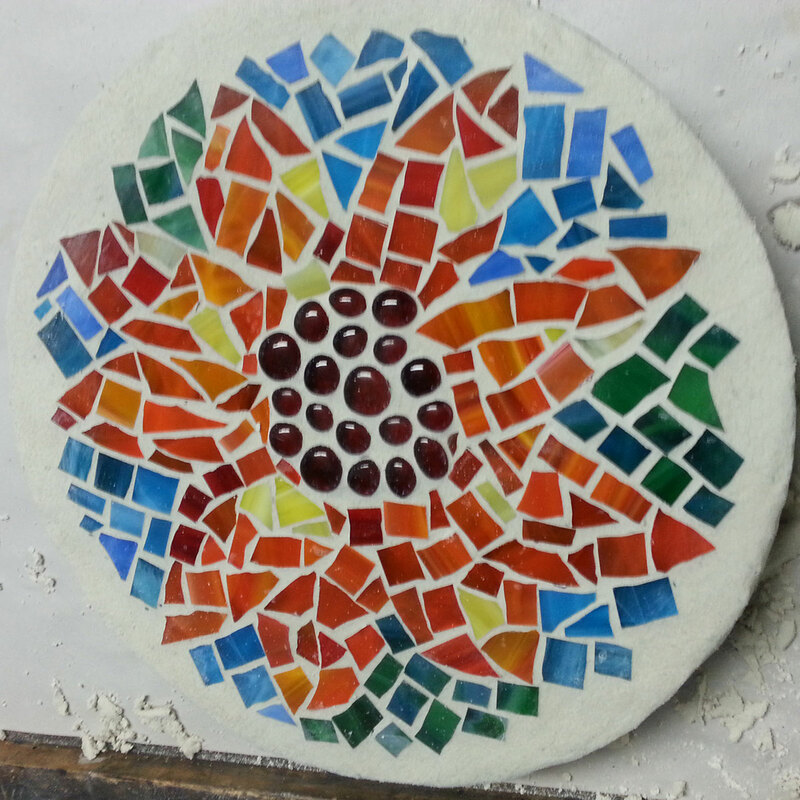 The 1st night we'll use Spectrum holly berry glass and the (glass on glass) mosaic technique on one side of the block. Students will cut out poinsettia flowers that will be fused during the week. 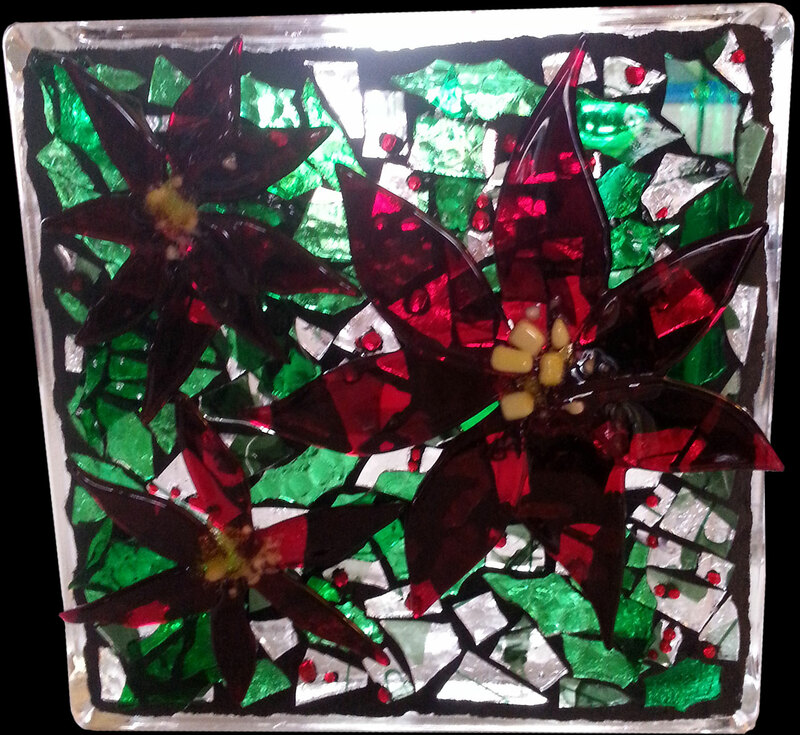 2nd class night, we'll grout our glass block and adhere the poinsettia flowers and extra leaves. All supplies included. Please bring glass cutters and mosaic nippers if you have them. Enjoy 10% off mosaic nippers when attending class or rent one for $5.00 per class session. Safety glasses required, also available at the store.